Three students from Poland's Warsaw University won the 31st-annual International Collegiate Programming Contest, dubbed the Olympics of computer programming. The Polish team vanquished 6,099 teams from 1,756 universities in 82 countries on six continents that began with regional contests last fall. Tsinghua University in China, St. Petersburg University of IT, Mechanics and Optics in Russia, and MIT in the U.S., finished competition in second, third, and fourth places, respectively. Cal Tech's was the only other U.S. team among the top 12 finishers. 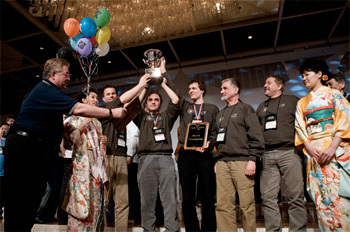 The contest is sponsored by the Association of Computing Machinery and IBM Corp. The Polish team--Filip Wolski, Marcin Pilipczuk, and Marek Cygan--was led by coach Jan Madey. The competition, which wound up last week in Tokyo, challenged students to solve a semester's worth of programming problems in five hours. The problems were modeled on real-world business challenges, such as improving airport baggage claim process, and decreasing the time it takes to load cargo ships.